During my relationship I had some doubts, inevitably. "Do I love him enough?" "Is he the guy for me? ", "Is this going well?". Additionally, the fact that I'm a doom-sayer does not contribute at all. Personally, I am a women with many many thoughts, which appears to be very chaotic. I like labeling thoughts, putting them in categories in order to process information and learn to deal with it. It took some effort, but I managed to develop a love theory to help organise my thoughts. I will explain it further in stages and hopefully it can be useful to any of you who are struggling with your own mixed-feelings related to relationship. The first stage is friend. A friend is a person whom one knows, like an acquaintance, a classmate or a neighbour. There are no deep feelings involved, just purely someone you would somehow trust, meet up once in a while or have a small chit chat. The second stage is like. Liking somebody can be very broad, but in this case it's about having positive feelings about a person, more than just knowing or being a friend. In this stage, like is a friend but with a special positive affection. Having a crush goes more intens compared to the previous stages. In this stage you can't stop thinking about that person and feeling some butterflies in your tummy. You also feel very attracted to that person, but also nerves and excitement appear. People can have crushes on people they know personally or even have multiple crushes. Love relates to a strong feeling of romantic affection, sexual desire and emotional attached bond. In this stage, you are passionately in love and devoted to each other. For first-timers, it can be recognised as puppy love. 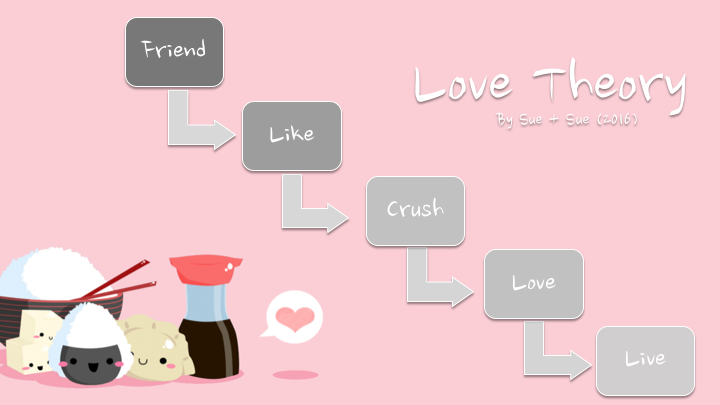 While being in love, likes and crushes with other people can occur. You can have multiple likes and crushes and even love multiple people, but it's very rare to find one whom you can live with, really. Even though you might have a crush on a person that doesn't necessary mean that you can live with each other. Same for love: being so deeply in love with someone doesn't always mean that you can share the rest of your life with each other, because of irritations, miscommunications or simply you just can't live together under one roof. Being able to live with someone who you love is a blessing. You have the mutual click, good communication, full trust and utmost respect for each other. It is not only about that person's characteristics and your love strength. I'm also addressing the environment of that person such as family, friends and career. How well do you fit with each other in these factors? How well do you go along with his/her parents or friends? Do you have the same level of career, ambition or passion? Are you sharing the same life and future goals? How well are you compatible with each other? And do you see yourself spending the rest of your life with him or her? If your answer is yes to all, then good! Your feelings are most likely reassured. If not, you should think about what you really want. Don't let your own (negative) feelings get in your way and don't be afraid to let go. The most important thing that I have learned during my relationship is that every relationship is distinctively different. There are no rights or wrongs. That the media shows how extremely passionate couples are or that your friend claims theirs almost perfect, doesn't necessary mean that your relationship must be the same. Indeed, being friends, like each other, having a crush on or deeply love someone is important, but in the end I think the most crucial part is whether you can literally live with each other, happily in love. It's not always a fling and when one gets older, the need to hold on to somebody is getting stronger. I don't propose that people always need to find someone (desperately), with referring to the quote in the beginning and like I said before: being able to live with someone who you love is a blessing. The value of this model is that it helps one to organise and clear thoughts and feelings within a relationship. However, even though you are in the last stage, you are still unaware of the future. Who knows what might happen. You might eventually separate in the future. And please read this carefully: The most important thing is that you both keep working and fighting for the relationship for it to work. It is about living together and no couple is a perfect fit, simply because we aren't perfect humans. This is just a theory that I have developed myself from my own experiences. Obviously every person is different so you might not recognise yourself in this theory or you do. In the very end, people don't need to (over)think things, but rather just live your life joyfully. Hopefully it helped you in any way. If you want to comment or critise my model, please leave a comment below. I am very interested in your opinion!